Two boys have become heroes after risking their lives to save two toddlers trapped inside a burning home. Isiah Francis (10) and Jeremiah Grimes (11), from Florida, were playing outside when they noticed smoke coming out of a nearby mobile home. The owner of the house was outside pouring water on the fire when Isiah quickly remembered several small children lived there. 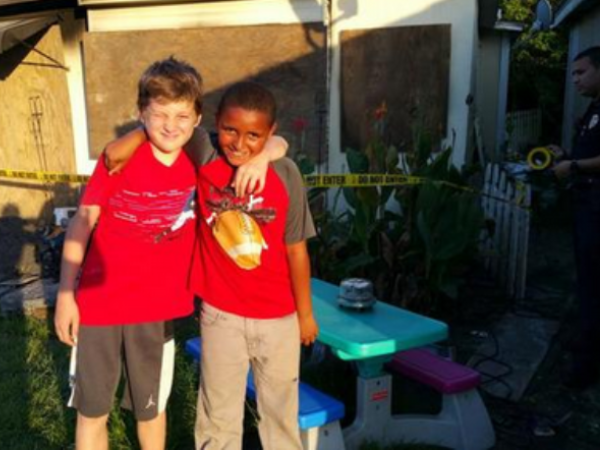 The young boy, who’s always dreamt of becoming a firefighter, ran into the burning house with his friend. “I was really scared because I thought I was going to get burned. I was nervous because there was so much smoke it was hard for me to see,” Isiah told Click Orlando. They found a 1-year-old and an 8-month-old inside a burning room. Bravely, the two boys carried them outside, before calling 911. Apparently when firefighters arrived, they found a 2-year-old and 5-year-old still trapped in the home. Despite the tough experience, Francis still wants to be a firefighter. “Even though I have to go through all this hard work, I still want to be one.” Investigators say the fire was most likely caused by a stove, and they plan to find out why the homeowner did not tend to the children when it started.